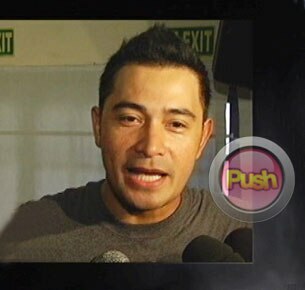 Cesar Montano flew to the U.S. last April 25 with wife Sunshine Cruz and daughter Angelina for a vacation. In an interview with the actor-director at the Ninoy Aquino International Airport, Cesar shared they intend to visit a famous museum in the U.S. since his daughter is into painting. He added that they will also watch the upcoming bout of Manny Pacquiao and Shane Mosley this May 7 in Las Vegas. Apart from family bonding, Cesar shared that he will also meet with Hollywood writer Donald Martin, who wrote the script for Al Pacino’s upcoming movie titled The Masterpiece, which is about the famous French artist Henri Matisse. Cesar said that Martin has previously written a script about a Filipino who migrated to the US and has expressed his desire to get Cesar to direct the movie. “[Martin] wrote another script bago matanggap ni Al Pacino ‘yung script niya [for The Masterpiece], ‘yung Getting to America. Siya ang nagsulat pero kuwento ng Pilipino na kaibigan niya na gusto niyang ako ang mag-direk, kukuha ako ng artista to do it,” explained Cesar. He added that he thinks Richard Gutierrez might be fit the role. Cesar also confirmed that he will do an indie movie with Ai-Ai de las Alas and said that he intends to meet up with the Comedy Concert Queen as soon as he gets back from his vacation. “I’m excited. As soon as I get back, kaming lahat I’ll sit down with Ai-Ai already para makapag-usap kami regarding that story, but definitely tuloy ‘yon.” He continued that he feels honored to be making a project with the comedienne and said that their movie will be an action-comedy.